-Oh hey, how was that house you went to look at today? -Umm… It was… weird. Very weird. We are three friends looking for a place together and we found a house at a great street, super close to the center. There is excitement, emails are sent and a viewing is arranged. There was a miscommunication between the agency and the current tenants so our appointment is pushed to 5pm. We go there, just to be greeted by another trio from our course, BAIS. And then another one. The agent arrives and we learn that there are five groups interested in the place. And only one will get it. It’s a bit like The Hunger Games. But for houses. It’s The Housing Games. That’s when the seriousness of the situation hit me. Everyone needed a new place and the market was super competitive. So yes, as the amount of students and expats increase, housing will be a challenge. It will be competitive but it’s not impossible. Below is a list of a few places that might be of help. This is kind of like a given. It’s the first option you have and it’s safe. Overall I can say that they are helpful although of course there are things that can be improved. This is when I learned that Facebook is not just about procrastination and kitten videos, it can help you find a place! Den Haag Housing, Find a room(mate) or house in The Hague – kamer(s) in Den Haag, Appartementen en Kamers Te Huur (Apartments and Rooms for Rent) are all nice options. I mainly know the ones for The Hague of course but I’m sure there are some groups for Leiden as well such as Leiden Housing. I’ve never personally used this one but I know people who did and it’s possible to find good and affordable rooms. One thing however is that you have to pay for a subscription. This is a helpful website as well but it also has a downside. We can’t have it all our way, can we? In this case it’s the agencies that you are contacting which means on top of the deposit you also have to pay the agency fee (which is usually one month’s rent and maybe a tax that I don’t remember the name of) But still it is a nice option. I wish you all the luck in this housing hunt and may the odds be ever in your favor! 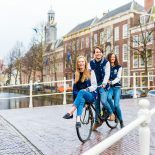 This entry was posted on June 1, 2014 by admin@theleidener in Ecesu, Practical Stuff and tagged Ecesu, Find a Room, Housing, Kamernet, Pararius, SEA Housing Office, The Hague.